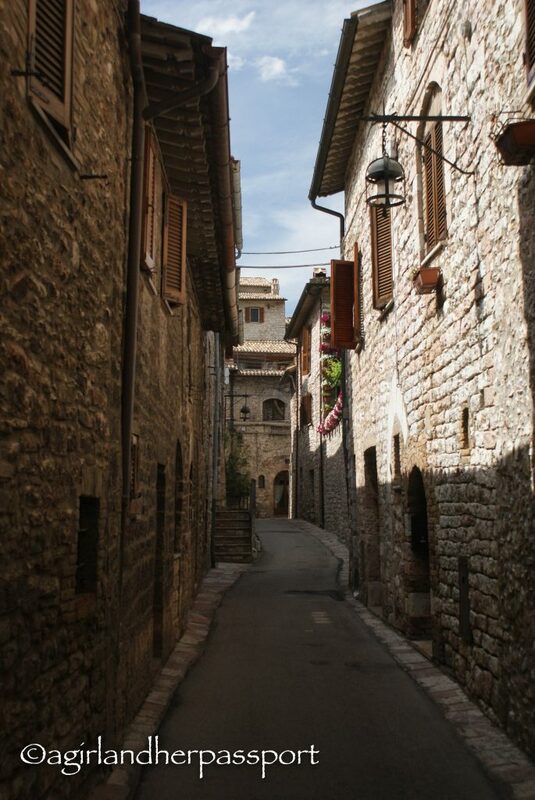 Dotting the hills of Italy, medieval towns are to be found all over the countryside. Each one unique with a story to tell. Given their locations, I often think about the logistics of getting stones to build these towns up these steep hills and how many hours it took. Every town is beautiful in its own way, and I have been lucky enough to have visited several of these small magical towns in Italy. Here are three of my favorites in Umbria. Amelia has been a favorite of mine since last year when my friends took me there. Located about an hour and a half drive north of Rome. 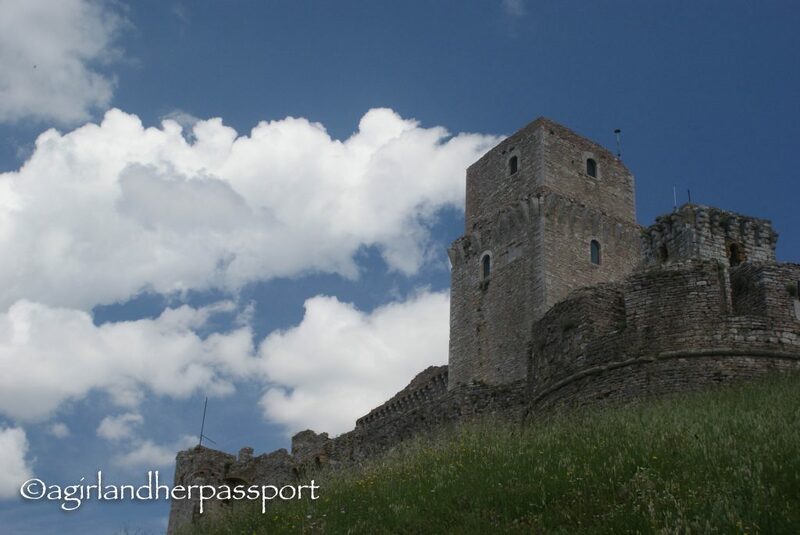 Amelia is claimed to be the oldest Umbrian town, and some say was founded around 1134 BC. Despite the age dispute, the minute you see Amelia you know it’s old. The walls are almost 11 and a half feet thick and surround the old town. 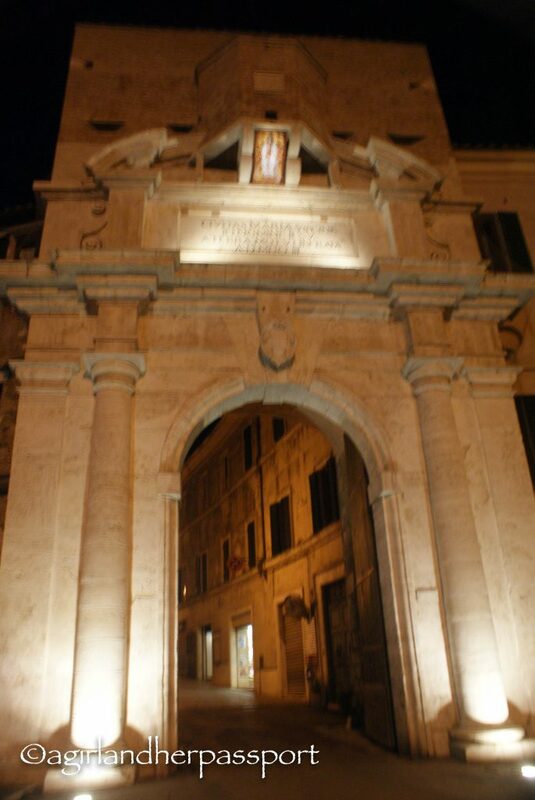 You can enter the historic center through the Porta Romana walking or by car. Careful driving in as it is a one-way road and the streets are so narrow that people flatten themselves to walls as cars pass by. 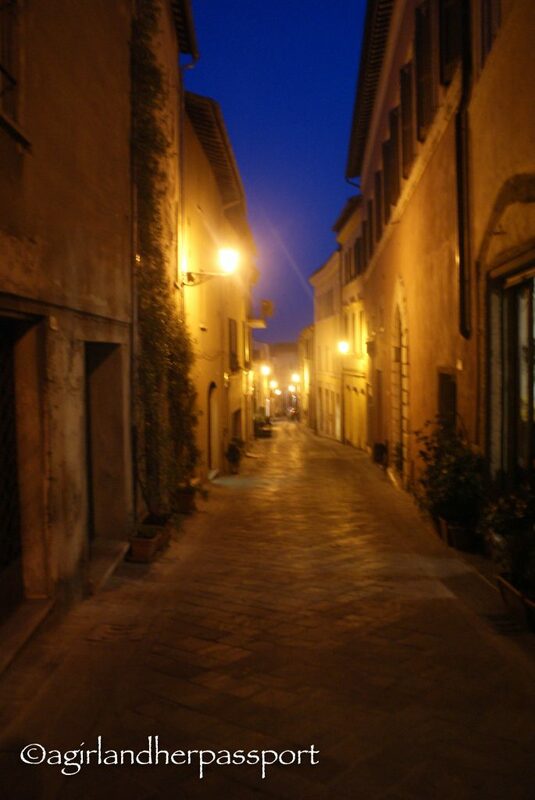 Walk through the Porta Romana, and you can explore all of the historic center on foot. Look out for the old Roman road that has been uncovered in parts of the town. There is an archaeology museum that houses a large bronze statue of Germanicus that was found in 1963. A tour of the Roman baths is also possible; however the tour is given in Italian, but you can get English descriptions of what you are viewing. Amelia is also home to one of my favorite restaurants to eat at in all of Italy, La Locanda del Conte Nitto. There are signs all over the town so that you won’t miss it. However, it is down a dark alley, but don’t let that discourage you. The food is fresh and local. My favorite thing here was the pistachio tiramisu! 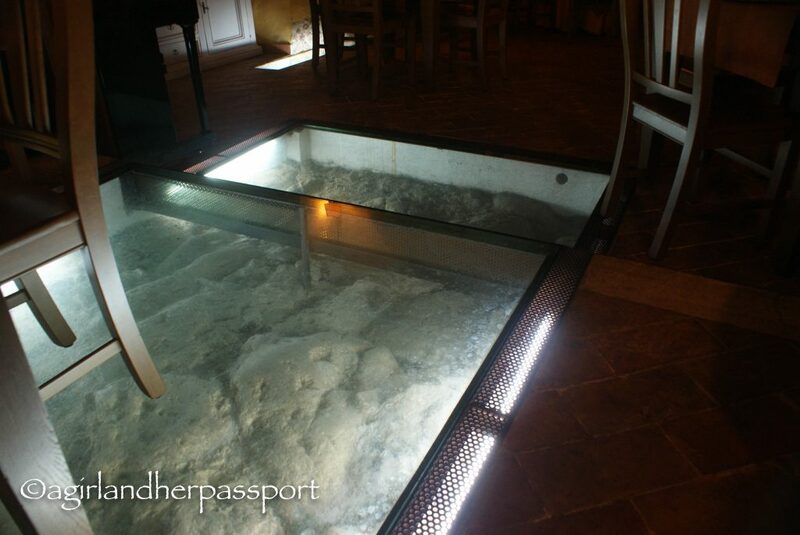 Not only that but you get to see more of the old Roman city that has been uncovered in the restaurant and has been glassed over for viewing. The birthplace of St. Francis is famous not only for being the birthplace of the saint but also for the large Basilica of St. Francis. The frescos inside the church are colorful and amazing. Several of them damaged by an earthquake in 1997 and restoration work continues. While many flock to Assisi for St. Francis, walking the streets of Assisi to view the architecture of this medieval town was the draw for me. The walk from my hotel to the Basicilia should have only taken me about 15 minutes, but I think it took me an hour because I kept stopping to look at buildings. Sitting above Assisi is the Rocca Maggiore castle. This fortification was built in 1174 and reduced to ruins in 1198 by the local populace. Starting in 1367 restoration was started and continued by several people over a hundred years. Seeing a castle of this size and being able to walk through it is a rare treat, but it isn’t up to standard when it comes to safety so walk slowly and use the hand rails when they are there. The ticket agent told me this as well when I entered. The best thing is to walk inside the walls to the turret and climb to the top of the tower. From here you can see all of Assisi, the surrounding valley, and the mountains. Even this deathly afraid of heights girl did it! You can even sleep in a medieval church in Assisi, read my review of the Nun Assisi Relais & Spa Museum here. 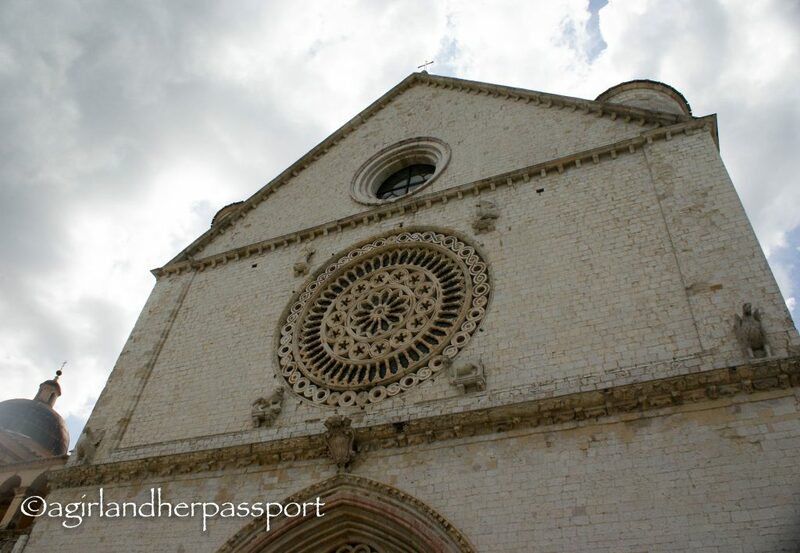 I heard of Gubbio through an American blogger who lives in Florence as it is popular with Italian tourists. The town is built into the side of a hill. This makes not only for impressive architecture it also lends itself to the towns ingenious solution of getting from one level of the city to another without having to walk in a zig-zag pattern up the hills, an elevator! Each level of the town had elevator access to another level. Not only did this save me from exhaustion and tired legs, but I was also able to see much of the town in one day. The highlight for me is the Palazzo dei Consoli, which was built between 1332-1349. 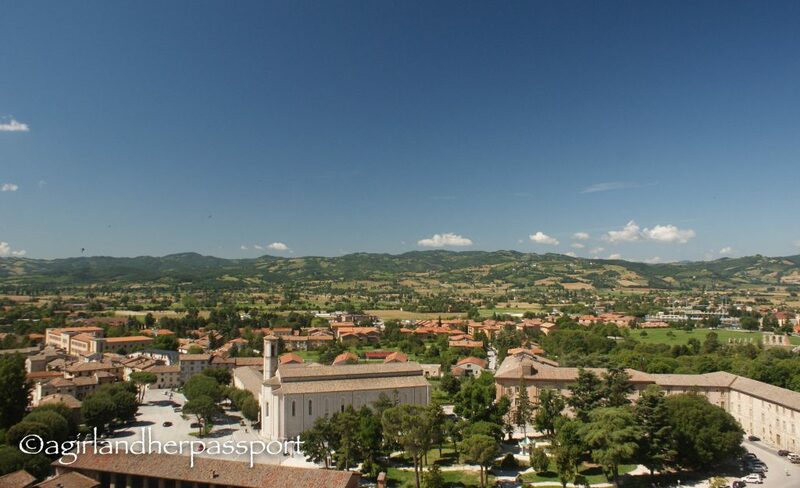 It dominates the Gubbio skyline and offers incredible views of the valley below. The Palazzo was the first building in Gubbio to have running water inside. 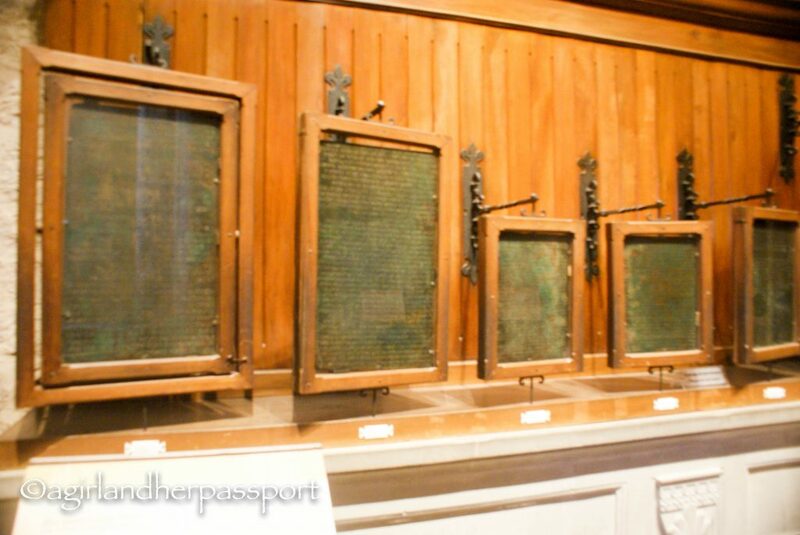 It also houses the Iguvine Tablets, which contain the writings of the Umbrian language. The tablets provide insights into the grammar of the language, now dead. The Cathedral of Gubbio is one of the prettiest churches I have seen. There is a beautiful circular window that depicts the three symbols of the evangelists, an eagle, an ox and a lion. 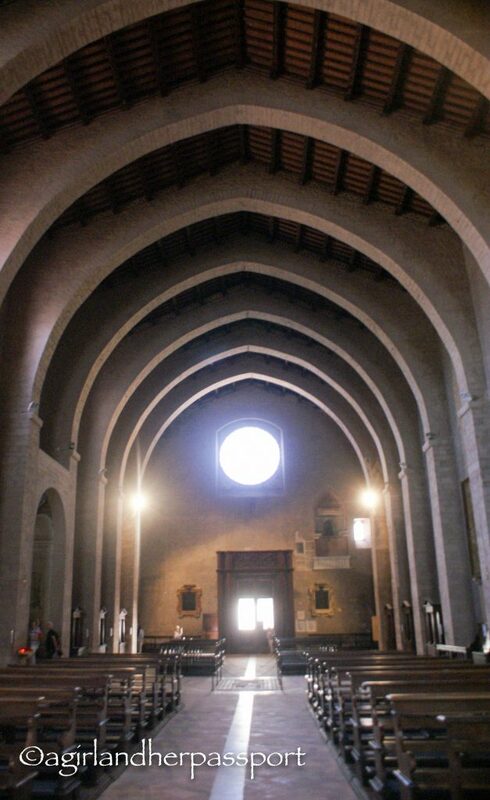 The church is defined by the 10 pointed arches that support the roof. Driving from each town is the best way to see them all and to experience driving the hills of Italy. Seeing one of these ancient towns from below is the best way to get the full experience. It also gives you a good sense of what someone would encounter if they were going to try to invade one of these hilltop towns. Have you been to any of these towns? What town in Umbria is your favorite? Share with us in the comments. 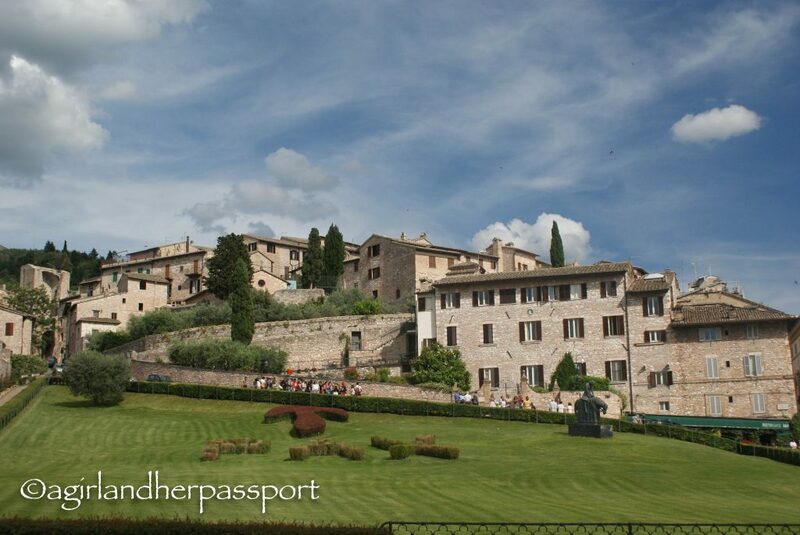 I have added Umbria on my list for my next Italian visit Insha’Allah… gorgeous shots of beautiful towns Tiff!! Let me know and I will give you even more tips. You will love it. Thank you hon! Wow ! Gorgeous shots! I love seeing all the towns. My eyes are on Amelia …. great post !! I absolutely do!! I haven’t made it there yet. Gelato is also my weakness in Italy. I think it’s okay because I always walk so much there. I’ve never thought to visit Umbria. Will certainly have to check out these places. Photos look fab! I think a lot of people overlook it but I love it. It is just as beautiful as Tuscany. Oh my goodness this is gorgeous Tiffany! 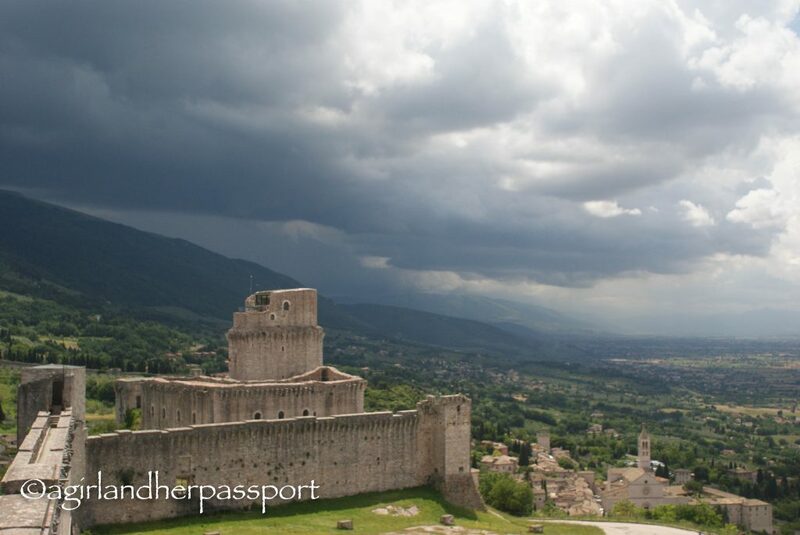 I LOVE the photos of Assisi with the moody sky. For some reason I love the look of that even more than the gorgeous blue skies. 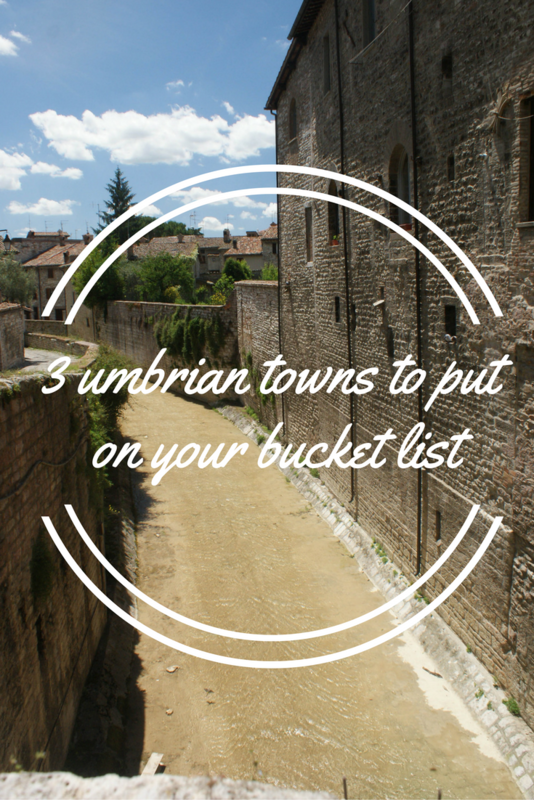 I had not heard of Umbria, but now I’d love to go!! I better download Italian on duolingo! I loved that sky too! Umbria is so beautiful and very underrated. Much less crowded than the big cities too. Grazie! Whilst I’m not keen to drive around Italian hills again, a week in Tuscany was enough, they do look like amazing places to visit. It definitely takes some patience to drive in Italy! This is especially true on the back roads. I would love to go to Italy… one day! Great post and images! It’s made me thirsty for an Italian adventure! 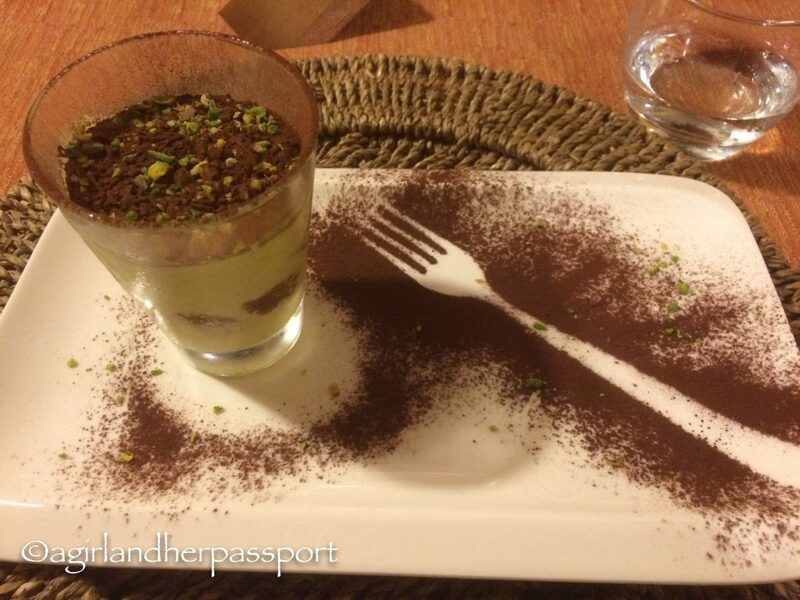 I definitely need to go back to Italy, taste pistachio tiramisu and stay in a medieval church!! Even though I have done it, I want to do it again! Thank you! Hope you get to visit them some day. This is such an interesting post and your photos make me want to visit for myself. So glad you liked it. Thanks! You should use it!! Any reason you haven’t yet? I’ve never been to Italy (I’m actually not sure why) – it looks absolutely stunning! It’s one of my favorites! It is stunning. All of it. 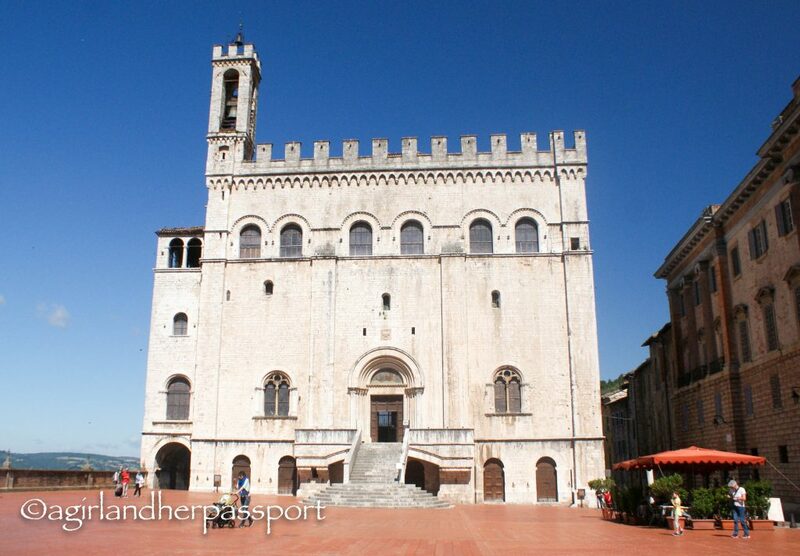 Apart from Assisi, I hadn’t heard of Amelia or Gubbio so I’ll add them to my Bucket list for visiting when in Umbria. The towns sound and look amazing – I do so love Italy ? These are towns I have never heard of, thank you for bringing them to me.